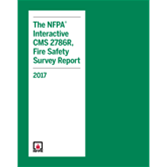 Access complete NFPA 101® and NFPA 99 Code content -- and more -- using the NFPA® Interactive CMS 2786R, Fire Safety Survey Report in PDF. The U.S. Centers for Medicare & Medicaid Services (CMS) has officially adopted the 2012 editions of NFPA 101: Life Safety Code® and NFPA 99: Health Care Facilities Code. As part of its Survey & Certification process, CMS also developed a series of Fire Safety Survey forms that the facility or the survey team uses to identify potential deficiencies. Now you can manage and maintain compliance with some of CMS's Conditions of Participation with an interactive version of CMS2786R Fire Safety Survey Report. Avoid errors and oversights in survey preparation and day-to-day compliance activities. Fill out and edit form data quickly on your computer or mobile device and validate data on the fly. A must for facility managers! This innovative NFPA tool is essential for any facility manager or surveyor who needs to manage, maintain or prove compliance with CMS's Conditions of Participation.